On May 19, 2007, at age 79, Antoine “Fats” Domino initiated a drive to secure the survival and continuation of New Orleans’ musical heritage. Launched with a benefit concert at Tipitina’s, the drive raised vital funds for the Tipitina’s Foundation* and secured its mission to preserve our local tradition of musical excellence. Given the loss of so many artists after Katrina and the destruction of so many music halls, archives and instruments, many wondered if the rich legacy of music in New Orleans could survive. But Fats never thought twice about reviving the city and its music. In collaboration with the Tipitina’s Foundation, Fats gave desperately needed support to local musicians and helped establish youth music programs that are now training our next generation of professionals. Significantly, Fats Domino contributed more to the city than his time or money. He raised our spirits with hope and inspiration. When Fats moved back after his evacuation, he told us—through his simple, quiet actions—that everything was going to be alright. Fats was back. The music was back. New Orleans would make it through. You don’t become an icon—a cultural leader—through what you say. You earn that status by what you do. And through his 81 years of life experience, Fats Domino has come to exemplify New Orleans and all that we love about it. Not concerned with the latest trend or impressing others—we do what we do ‘cause we like it. That’s Fats Domino, who continues to prove that if you trust yourself and follow your heart, you can achieve true greatness. 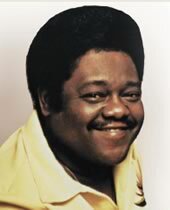 Fats Domino … Peoples Health Champion.